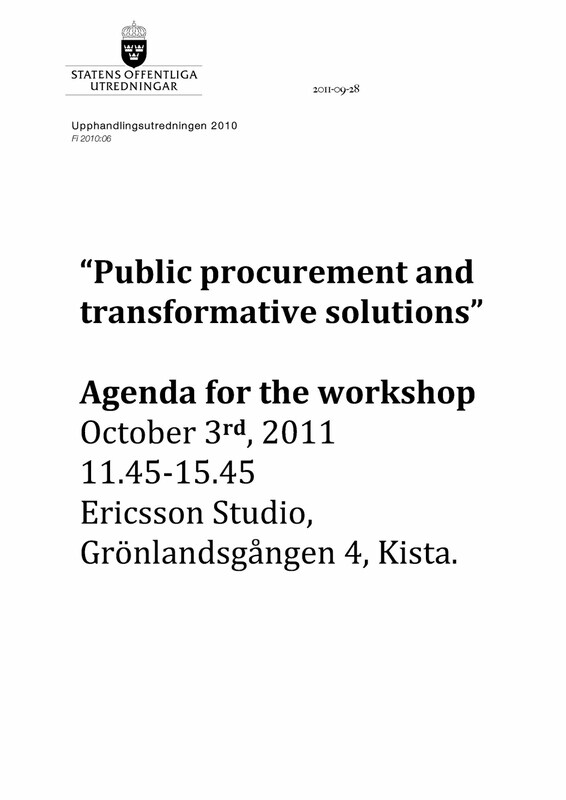 The workshop about the potential role for public procurement to support transformative solutions was very inspiring and constructive with concrete ideas for ways forward. Download PDF for agenda here and read below for the background. To improve fuel efficiency when commuting represents an incremental improvement – to help change working habits, e.g. through teleworking, represents a transformative shift. To make newspaper production more resource-efficient represents an incremental improvement – to massively expand e-paper subscriptions is a transformative solution. To improve efficiency in fossil-based power production represents an incremental step – to develop buildings that are “net producers” of renewable energy is a transformative solution. To enhance efficiency in the use of e-journals in hospitals represents an incremental improvement – to offer e-health solutions that promote more healthy lifestyles and provide remote connection to medical services is a transformative solution. To improve recycling of materials represents an incremental step – to develop systems for closed loops of materials in the techno-sphere is a transformative solution. The changes needed are significant. A number of different measures are required to ensure an accelerated uptake of transformative solutions. International agreements and EU policy declarations have already identified Public Procurement as an important tool to help promote resource efficiency and low-carbon solutions. 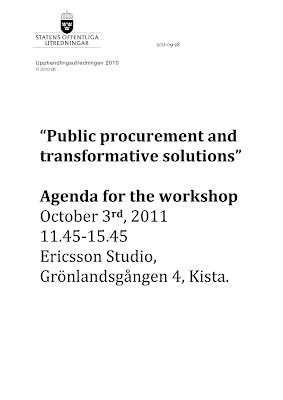 In so doing, the hope is that Public Procurement will both improve competitiveness and help meet the EU 2020 targets. A number of initiatives are underway within the EU Commission and some of the Member States to enhance the efficiency and effectiveness of Public Procurement. There is, however, no established framework for the specific promotion of transformative solutions in the context of resource efficiency and low-carbon technology. Such a framework is urgently needed as several studies indicate that Public Procurement rules and practices of today often are seen as barriers to innovative solutions, instead of being at least neutral and hopefully also supportive. The Committee of Inquiry on Public Procurement is mandated by the Swedish Government to undertake a thorough review of the Public Procurement rules and practices. The review shall be completed before the end of June, 2012. The review is undertaken in the context of a parallel review of EU legislation. Green Public Procurement is one of several key areas in the review. The Committee is eager to explore new and innovative ways to use Public Procurement in the promotion of sustainable solutions, not least within the area of infrastructure development. To assist the Committee in these endeavours, Mr Dennis Pamlin has been asked to prepare a report on the role of Public Procurement in the promotion of transformative solutions for a low-carbon economy. The workshop on October 3rd is organised as an integral part of Mr Pamlin’s assignment.